lightly stressed when p equals 0.5 per cent, p is given by l()0Aymi/l>d where i4s,rCq i* the area of tension reinforcement required in the section. Interpolation between the values of p indicated is permissible. In the case of slabs it is reasonable to assume lha: they are lightly stressed. 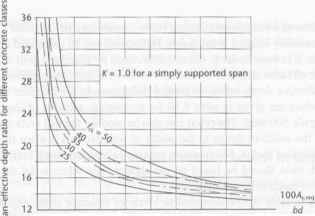 Since the value of allowable span-effective depth ratio is affected by both reinforcement ratio and concrete strength it may be more convenient to use the char in figure 6.3 which is for a simply supported span with no compression steel together with a modification factor K (as shown in tabic 6.10) according to member type. Thi-approach is based on the same basic equations and offers greater flexibility than relianc. placed on tabulated values. (a) For spans longer than 7 m (except flat slabs) and where it is necessary to limit deflections to ensure that finishes, such as partitions, are not damaged, the basic values should be multiplied by 7/span. (b) For flat slabs with spans in excess of 8.5 in, similarly multiply the basic ratios by 8.5/span. (c) For characteristic steel strengths other than 500 N/mra2, multiply the basic ratios by 500//yk. (d) Where more tension reinforcement is provided (/lvprov) than that calculated G4s,req) at the ultimate limit state, multiply the basic ratios by /K.prov/<4s.rcq (upper limit = 1.5). A rectangular continuous beam of class C25/30 concrete spans 10 m. If the breadth is 300 mm. check the acceptability of an effective depth of 600 mm when high yield reinforcement, /yk = 500 N/mnr, is used. At the ultimate limit state it is determined that 1250mnr of tension steel is needed and 3 No. 25 mm diameter reinforcing bars (ASlprov 1470mm2) are actually provided in an interior span. which is less than the allowable upper limit, thus deflection requirements are likely to be satisfied. The code suggests that deflections should be calculated under the action of the qua* permanent load combination, assuming this loading to be of long-term duration. Hencc the total loading to be taken in the calculation will be the permanent load plus . proportion of the variable load which will typically be 30 per cent of the variable loau for office-type construction. This is a reasonable assumption as deflection will be affected by long-term effects such as concrete creep, w hile not all of the variable load is likely to be long-term and hence will not contribute to the creep effects. 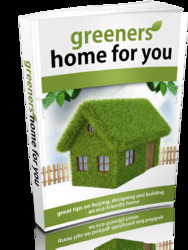 4. the effects of floor screeds, finishes and partitions are very difficult to assess -frequently these are neglected despite their 'stiffening' effect. It may be possible to allow for these factors by averaging maximum and minimum estimated effects and, provided that this is done, there are a number of calculation methods available which will give reasonable results. The method adopted by EC2 i-. based on the calculation of curvature of sections subjected to the appropriate moments with allowance for creep and shrinkage effects where necessary. Deflections are then calculated from these curvatures. A rigorous approach to deflection is to calculate the curvature at intervals along the span and then use numerical integration techniques to estimate the critical deflections, taking into account the fact that some sections along the span will be cracked under load and others, in regions of lesser moment, will be uncracked. Such an approach is rarely justified and the approach adopted below, based on EC2, assumes that it is acceptably accurate to calculate the curvature of the beam or slab based on both the cracked and uncracked sections and then to use an 'average' value in estimating the final deflection using standard deflection formulae or simple numerical integration based on elastic theory. 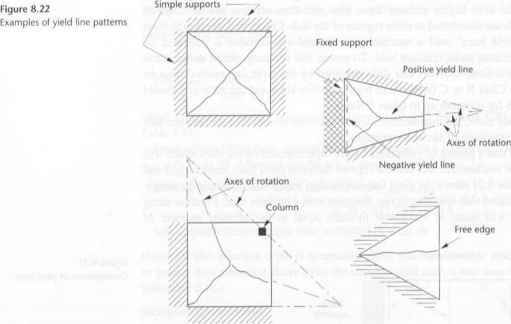 The procedure for estimating deflections involves the following stages which are illustrated in example 6.2.
stress in the tension steel for the cracked concrete section stress in (he tension steel calculated on the basis of a cracked section under llie loading thai will just cause cracking at the section being considered. Appropriate values of concrete tensile strength to be used in the calculation of rrsr can be obtained from table 6.11. In calculating (,. the ratio can more conveniently be replaced by (Ma/M) where Ma is the moment that will just cause cracking of the section and M is the design moment for the calculation of curvature and deflection. In order to calculate the 'average* curvature, separate calculations have to be carried out for both the cracked and uncracked cases. The assumed elastic strain and stress distribution for an uncracked section is shown in figure 6.4.